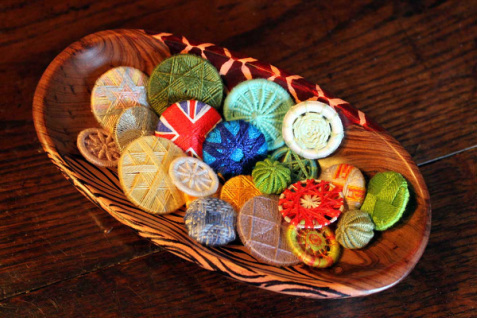 Our local town, Leek, was the centre of the button industry as early as the 1600's, the Death's Head wrapped button being one of the most common types. At the other end of the country, the Dorset button began life in Shaftesbury, the most famous being the Dorset Crosswheel. Four different buttons will be made on the workshop - the Death's Head, Austrian Star or Shirtlace, Yorkshire and Dorset Bouquet or Crosswheel (see photo below). This workshop is suitable for beginners. Please note that some buttons require tight winding and therefore a degree of dexterity is required. We shall be using cotton and silk threads on rings or button bases to help you to make the four different button types during the workshop (Photograph shows from top left to right - Yorkshire, Shirtlace, Dorset & Leek buttons). There will be a choice of threads. You will be shown variations of the button types to make at home. The number of buttons you will make on the workshop will depend to a large extent on your dexterity.